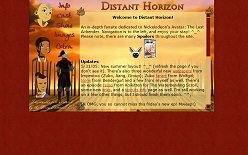 Curious about Distant Horizon's layouts? Then this is the place for you! Lasted: April 16 '12 - ? 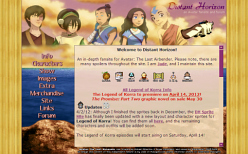 Comments: A new layout for the Legend of Korra premiere, albeit a few days late. The main image is official art of Downtown Station in Republic City from Korra Nation Tumblr, with the tile background made by me. Images were made/modified in GIMP and html written in Notepad. The site is still rocking iframes, although I would love to upgrade it to PHP. ....one day. 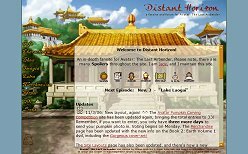 Comments: Finished in time for the final Avatar episodes, this layout is 'full circle' for this website and so it is very similar to the first DH layout, design wise. 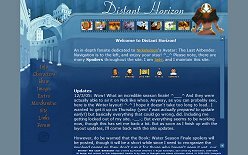 Thankfully this layout looks much better than the old one, which is just one more example of how I and this site have grown since it began 3+ years ago. =3 What a ride it's been. The background image is from "The Boiling Rock" episode with colors modified by me, and the characters are from the mid Book 3 episodes. 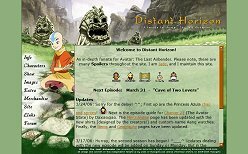 All screenshots are from Iroh.org because I was feeling lazy and their caps rock. <3 Images were modified in PSP7 and html written in Notepad. Comments: With Book: Fire on the horizon, it's only right to have Fire Nation themed layouts. Unfortunately though, there hasn't been too many shots of the Fire Nation so far. ^^; So the main image comes from the Fire Nation festival in ep. 16 from Book: Water. There's also a little Puppet Ozai on the bottom of the navigation bar. 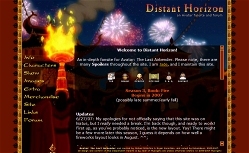 Images were modified in PSP7, and html written in Notepad. Comments: What I really love about this layout is how malleable it is. It's so easy to add decorations and color filters to change the time of day or season, and even without the extras it still looks nice and classic. Ba Sing Se is deceptively beautiful. 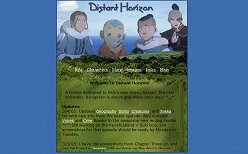 The layout image is from Nick.com and is of Aang's temporary home in Ba Sing Se during Book: Earth. 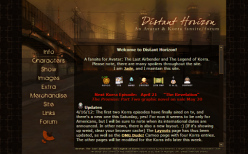 It was modified in PSP7, and html was written in Notepad. Comments: I've always liked this image of the giant stone statues in a grassy valley. They kind of look like Samurai helmets, but would that make them Fire Nation? What are they doing in the Earth Kingdom? Spring is the season of new beginnings, but not the season of answering questions. =/ Layout wise, it's exactly the same as the previous Winter Layout. I like this format -- it's easy to change and looks good in many screen resolutions and browsers. I'll probably continue to use it. Image is from this official wallpaper, modified in PSP7, and html written in Notepad. Comments: It's been quite a year. ^^; Since most of Book One was about the gang getting to the North Pole, it was only right that this winter layout should show their success. The main layout screenshot is from episode 18, while the screens in the top banner are from eps 2, 3, 7, 9, 15, & 18. This layout uses frames; all images were modified in Paint Shop Pro 7 and html written in Notepad. Comments: Hmm, this only took a few days to make. Although deciding how it should look took much longer. ^^; But once I figured it out, everything fell into place and it was rather easy, if not time-consuming. The landscape image (which is of Maui) was taken by Photodisc Green of GettyImages.com. The character images are screenshots from eps 1 and 2 that I took with my digital camera. All of the images were modified in Paint Shop Pro 7, and html written in Notepad. This layout used tables, div positioning, and iframes.